At some point, everyone experiences some dental decay, damage, or regular wear and tear that leaves their smile looking and feeling far from its best. Whether you have just one compromised tooth or an entire mouthful, New Haven Dental Group can help you regain a strong and healthy smile using restorative dentistry. All of our restorations are custom-made for each patient using the most advanced materials, and in the end, we’ll make it seem like nothing was ever wrong with your teeth in the first place. To learn more about how we can fully repair your smile in just one or two appointments, contact us today. When it comes to fixing cavities, broken teeth, and even replacing missing teeth, dental crowns and bridges are two of the most versatile treatment options available today. Shaped to look, feel, and function just like natural teeth, these restorations are painstakingly designed by our team to fit seamlessly with any smile. 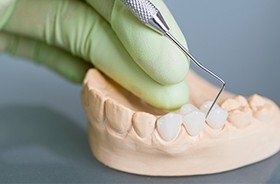 In most cases, our crowns and bridges are made from 100% dental porcelain because this material is able to deliver the most lifelike results possible. Fillings used to be made of a material called amalgam, which left a large gray mark on the tooth and even made it more sensitive to hot and cold temperatures. 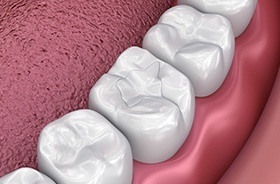 Today, when we need to fix minor cavities, we instead use composite resin-based fillings. These can be specially-shaded to perfectly blend with any patient’s enamel, plus their metal-free composition means that repaired teeth don’t experience increased sensitivity. Better yet, they enable us to preserve as much of a tooth as possible, ensuring it’s durability for many years to come. 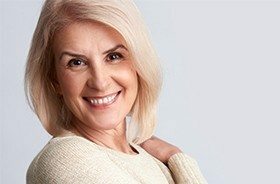 If you are missing several teeth, dentures are able to replace all of them at once using a strong and natural-looking prosthetic you can trust to look as good as it feels. 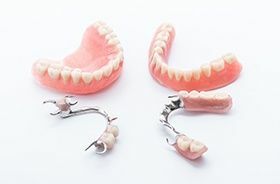 Partial dentures can fit in among any remaining teeth to fill in the gaps, while an entire arch can be replaced all at once with a full denture. Whatever you might need, we can design a prosthetic just for you that will fully restore your bite, oral health, and confidence at the same time.